Supernova - Solar System Planets And Moons Section. One theory is that it's a supernova remnant. One theory is that it's the remnant from a supernova. Mystery at the Heart of the Milky Way. Something is radiating high-energy gamma rays at the heart of our Milky Way galaxy, and Astronomers aren't sure what it is. The object was discovered using the High energy Stereoscopic System (H.E.S.S. ), an array of four telescopes, in Namibia, South-West Africa. One theory is that it's the remnant from a supernova that exploded 10,000 years ago; this has enough energy to accelerate gamma rays so strongly. 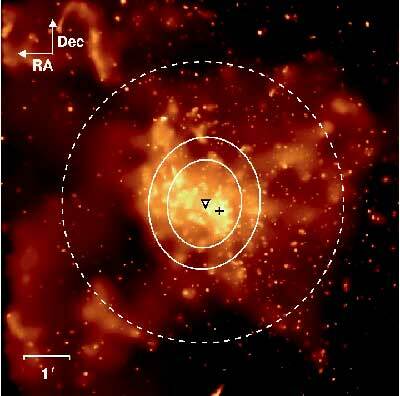 The object is also very near the supermassive black hole at the centre of the Milky Way, so this radiation could be somehow associated with it. Glaciers Speed Up When Ice Breaks Away. When the Larsen B ice shelf broke away from the coast of Antarctica two years ago, nearby glaciers surged, flowing eight times faster. This is according to a new study by NASA-funded researchers who used several Earth observing satellites to track the movements of Antarctic glaciers. It appears that the ice shelves hold glaciers back, like a dam. Once the shelf breaks up, the glacier is free to flow quickly. These glaciers aren't that large, but this research gives scientists an understanding of what will happen as rising temperatures continue breaking up Antarctica's ice shelves. Mars Rovers Get a Mission Extension. NASA has approved a six month extension for the Mars Exploration Rovers, giving them more time to continue exploring the surface of Mars for evidence of past water. Both Spirit and Opportunity have completed their original three-month mission, and an additional five-month extension. Even though the rovers are well past their expected operational life, neither one is showing much sign of wear, so NASA scientists plan to keep them running. The rovers took a 12-day break earlier this month as Mars passed behind the Sun, disrupting all communication to and from the Red Planet.